Welcome to the Lenscraft Newsletter February 2018. Learn to make complex selections in Lightroom. An idea to support Camera Clubs and Photographic Societies. It might also help you. Release date for my next book. Don't want to use Amazon Kindle, I have an alternative. Ingleborough in Winter, The Yorkshire Dales. An essential part of improving any photograph during editing is the ability to make selective adjustments. With Photoshop, there are many options and powerful techniques you can use. But Lightroom is a bit of a blunt instrument by comparison. So how can you create precise selection in Lightroom? Let’s take a closer look at this panoramic image of Ramshaw Rocks. To create an effective adjustment, we need to separate the sky from the ground, so we can treat them differently. Starting image of Ramshaw Rocks prior to adjustment. Although there’s a nice outline to the rocks, it’s going to be difficult to create a precise adjustment using Lightroom’s’ adjustment tools. Here we’re creating a selection using the Graduated Filter, shown by the red overlay. 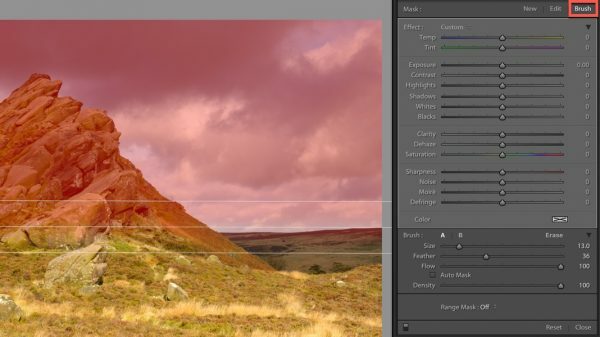 Image showing a Graduated Filter selection in Lightroom. You can turn the red overlay on and off using the option “Show Selected Mask Overlay”, just below the image. It’s a good idea to keep the mask overlay visible whilst you modify the selection. Although we can easily select the sky with the Graduated Filter, we also select a large part of the ground. Any adjustments we apply with this selection, will also affect the ground which we don’t want to happen. The solution is to clean up our selection using the mask Brush tool in Lightroom. With the Graduated Filter selection in place, select the Mask Brush for the filter. You can see this highlighted in the top right of the screenshot below. Click the Mask Brush option and brushes become visible at the bottom of the filter panel. There are two painting brushes, A and B as well as an Erase brush. Select the “Erase” brush by clicking it and configuring to have a Feather of 0. This gives it a hard edge and makes it easier to work accurately. Having greater control over the brush helps avoid spilling over into other areas when you paint. Also set the Flow to 100 so a single stroke will erase an area. And be sure the “Auto Mask” option is set to off. You can then paint over the selected area (indicated by the red mask overlay) to remove it from the rocks. As you paint, keep away from the edges of the rock to avoid painting over the sky in error. If you do make a mistake, use the Undo feature in the Edit menu to fix it. If you find it difficult to be accurate, zoom in to a higher magnification whilst you paint. Using a 1:1 magnification can help you clean up nearer to the edges in the image. Once finished, your mask would look like the illustration below. Graduated selection with unwanted area removed by the Lightroom Erase Brush. Notice there is still a red selection around the rocks. We now need to make a second pass with the Erase mask brush. This time we’ll need to turn on the “Auto Mask” option but the other settings are the same. Paint carefully around the edge of the rock to remove the rest of the selection. As you paint, keep the centre of the brush over the area rocks where they’re covered by the mask. It’s the Auto mask option that makes this work by sampling the area from the centre of the brush. Lightroom then removes any similar pixels found within circumference of the brush. You can see a magnified section of the work in progress below. Cleaning up the selection with the Erase brush in Lightroom. It’s a good idea to work at 1:1 magnification whilst you’re doing this clean-up work. Be sure to paint slowly with the Erase brush as the clean-up can take a lot of extra processing power. You may also find it’s necessary to paint over an area with a few brush strokes to remove the selection completely. You can see the completed mask below with the selection removed from the rocks. Completed selection of the sky with no overspill to the ground. Now we can adjust the sky to make it slightly cooler and a little stormier. Let’s then use the same technique but this time to select the rocks but not the sky. You can see the second selection in the screenshot below. Selecting the ground but not the sky using the Graduated filter tool in Lightroom. With two selections it’s possible to adjust the sky and the ground independently. Here we can see the finished image after cooling and darkening the sky. The global sharpening has been removed and noise reduction increased. The ground and rocks have had the contrast and sharpness increased. The colour temperature and the saturation have been increased to enhance the feeling of warmth. Finished image of Ramshaw Rocks near Leek. Initially developed as part of my latest book about the Lightroom Develop Module, I wanted to share this with Lenscraft readers. If you want to see this and other techniques in action, I recorded a few videos for You Tube. You can watch them on Lenscraft http://bit.ly/Lenscraft-Lightroom-Selection. Over the course of a year I tend to do a few presentations to Camera Clubs. Mostly I keep these local to avoid travelling costs, but this restricts the clubs I can support. Recently three different clubs have contacted me, all wanting to use worked examples from my books, in their practice evenings. Unfortunately, I can’t do this, but it gave me an idea and I need your help to assess it. I’m considering developing worked examples, like those in my books, that clubs could use. I wouldn’t publish these in my books, but any Lenscraft Member could download them from the Lenscraft website. I’m also happy to have these shared at Camera Clubs and Photographic Societies anywhere. All I ask is you don’t share them on other websites. The sample image used, allowing people to follow the example. A video where I demonstrate the example. This would probably be around 10-15 minutes long. Club members could then follow the instructions using the image, then watch the video to compare. What I need is your view to help assess this idea. If you have a minute, please use the link below to answer a couple of questions. It would really help me. Last year I asked for feedback about what my next book should be. The clear winner was a book covering the Lightroom Develop module, with almost twice as many responses as the next most popular. I have now been hard at work on this book for a couple of months and the first draft is almost complete. If you want to get the most out of Lightroom for image editing, this book will help you. It doesn’t cover absolutely everything. But it does explain all the adjustments and how best to use them. It assumes the reader is starting with almost no knowledge, but it’s fast paced and takes you through to an intermediate/advanced level. It won’t though try to turn you into a knowledgeable Lightroom expert. The focus is on helping you acquire skills and proficiency with Lightroom, that can make a real difference to the quality and beauty of your photography. As usual, there will be practice exercises and full length worked examples for you to follow. The image files to support the examples will be available on Lenscraft. The book will launch in February, all being well. Keep an eye on your in box for the release date. I aware that not all Lenscraft members use or even like eBooks on Amazon. To address this, I promised I would investigate releasing my books on platforms. Following a brief trial with one book on Smashwords, I now have four books on other platforms including the Lenscraft Creative Store. Lenscraft in PDF format for immediate download. Kobo which publishes in the ePub format. Google Play Books which also uses the ePub format. Smashwords is also acting as distributor for me so it’s possible my books may crop up on a few lesser known sites. The plan is to release my back catalogue to the above sites as time permits. I’m also working on the print versions of the books, but more about that next time.